No Comp scored another great year in 2003, this time by going deeper into practical instructions for campaigning, and also by examining the smaller stories in greater detail. While the high profile victories of anti-HLS activists were given their due, inspirational figures who had passed on were also given touching coverage. 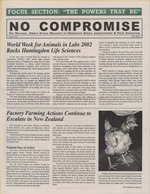 Issue #20 features articles on early Band of Mercy and Animal Liberation Front founder Sue Smith, and Sweden’s animal lib die-hard, Ake Soderlund. Similar examinations of our past, and the courageous figures whose shoulders we stand upon, pepper the 2003 issues. 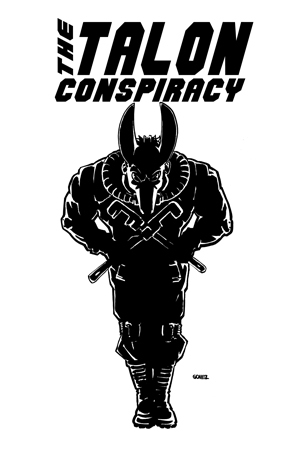 Of particular note is the article on Henry Hutto in issue #21. 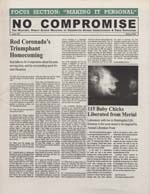 2003 was also the year that Rod Coronado finally got off of probation and was allowed to participate in the movement again. His writings for No Compromise were as subversive and inspiring as ever, and it is easy to see why the government considered him such a threat. As the year progressed No Comp moved to a magazine format and tightened their graphic design skills in response to Jake Conroy’s work on the SHAC USA newsletter. These glossy issues were excellent contributions to the movement, and it is a shame that in only a few more years NC would cease to exist altogether. These information (and inspiration!) packed issues are worth reading again to inform and encourage our current actions. 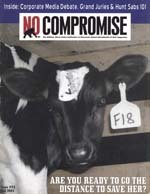 If you have been following our posting of the complete No Compromise than you have read along as the new, 1990s militant grassroots took its first steps, stumbling along an exciting, and at times error filled path towards animal liberation. Those early years saw a lot of dedication and courage, but sadly little in the way of new tactics or intelligent planning. 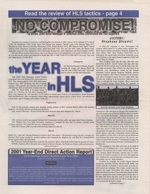 That all changed in 2001 with the arrival of the anti-HLS campaign in the United States. The focus suddenly shifted from scattershot regional targeting to a single, international pressure point and the results were encouraging. 2001 wasn’t just about the fight against Huntingdon. The tactics developing in that one small struggle were inspiring activists globally to step up the fight against all areas of animal abuse, and sadly, some of our friends ended up in prison as a result. The support of these jailed comrades was inspiring, but our movement was dealt a terrible blow as Barry Horne died on Hungerstrike. That was not the only tragedy we would witness in these 12 months. Jeff Luers was sentenced to nearly 23 years in prison for an act of sabotage which harmed no one. Animal liberationists had been a strong force in the growing movement against globalization of capitalism, and at the 2001 G8 summit we watched as protestors and media were brutalized and bloodied in the lead up to the police murder of Carlo Giuliani. And of course, non-humans continued to be slaughtered in endless, unfathomable numbers. 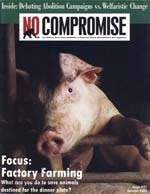 The tone of these two issues of No Compromise may have been optimistic, even cocky, but those of us on the ground knew that times were tough and getting tougher.